World War II Novel Study Bundle, Seven Complete WWII Literature Units! 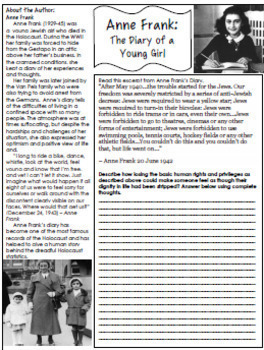 No-Prep novel study for the bestselling "Anne Frank, The Diary of a Young Girl", a standards based interactive notebook literature guide with follow-up reading response questions for every entry as well as vocabulary, writing projects, activities and enrichment projects. Teacher friendly engaging lessons to use with this award winning diary autobiography in your classroom while encouraging critical reading skills. Everything you need to use this novel in your classroom effectively is included with this resource. 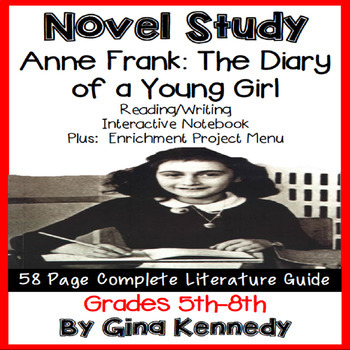 This novel study includes at least ONE PAGE OF READING RESPONSE QUESTIONS FOR EVERY SET OF ENTRIES! 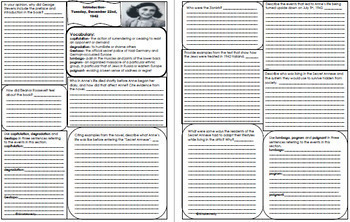 This interactive notebook includes comprehension reading/writing response activities and vocabulary for every chapter of the book as well as additional text structure review practice exercises related to the novel. Great for guided reading, small groups or independent reading. All new products in my store are 50% off the first 24 hours. Be sure to follow my store above to receive notice within the first 24 hours that new products are listed. 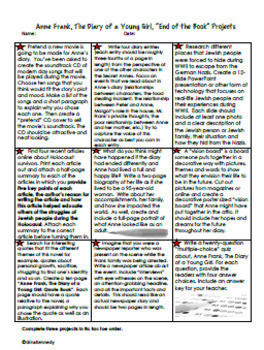 SIX NO-PREP Trifold Book Reports to Use With Any Novels!